Gerald Chukwuma (b. 1973) lives and works in Lagos, Nigeria. He graduated in 2003 with First Class Honours from the University of Nigeria, Nsukka. 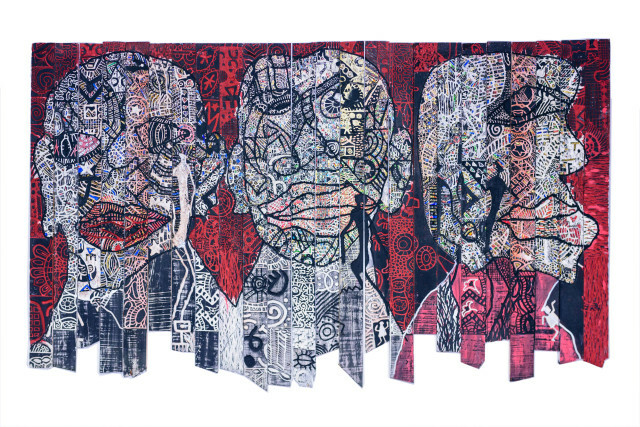 Chukwuma has participated extensively in solo and group exhibitions across Nigeria and internationally including: Standing Ovation, Gallery 1957, Accra (2017), Art X Lagos, Civic Center Lagos (2016); People’s Paradise, Temple Muse, Lagos (2016); Essentials, Alexis Galleries, Lagos (2015); The Contemporaries, The Wheatbeaker, Lagos (2015); Today In History, Thought Pyramid Art Centre, Abuja (2015); Soaking Up Beauty, Constant Capital, Lagos (2014); Highlife II, Ethnocentrique, Lagos (2013); Music Lesson, Alexis Gallery, Lagos (2012); Highlife I, Exhibition of Designs and Art, Ethnocentrique, Lagos (2011); Heden Daagse Afrikaanse Kunst, Amsterdam (2010); Pachakucha: Inspire Japan, Terra Kulture, Lagos (2009); Reclaiming Africa, Goethe-Institute, Lagos (2009); In Pursuit of Knowledge, Civic Centre, Lagos (2009); Africa Now, The World Bank, Washington, D.C (2009); Moderne Afrikansu Kunst, Danish Center for Culture and Development, Copenhagen (2009); Mouling Matter, Pan African University, Lagos (2008); The Unbreakable Nigerian Spirit, Galarie 23, Amsterdam (2008); With A Human Face, Pan African University, Lagos (2006); Salt of the Earth, PACA Biennale, Alliance Francaise, Enugu (2004) and Awakened Instincts, Nimbus Art Center, Lagos (2003).